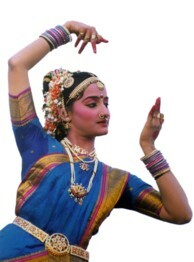 Kuchipudi Dance Academy is a pioneering Kuchipudi dance institute in Dombivili, Mumbai. It is a non-profit organization, established in the year 1981 by Smt Vijaya Prasad with an aim to popularise Kuchipudi in Maharashtra. The teaching is imparted in Guru Shishya Parampara style. Each student is personally trained under the able guidance of the guru herself. At a time when this sacred art form is elusive to the common man due to high commercialization, this institute relentlessly trained potential and talented students irrespective of their economic capabilities. Fellowship from the Government of India in the field of Kuchipudi Dance. Certificate of Merit from Kuchipudi Kala Kshetra. The academy has conducted many workshops at many prominent colleges and institutes with aplomb. Over the years apart from traditional dance items, students have been taught many new compositions by Vijaya Prasad. Many milestones have been crossed and many more yet to cross. The academy is hopeful of getting Telugu University affiliation, which will not only affirm academic credentials our students but will also help in garnering proper building with facilities and a library for students to research and get in-depth understanding on various dance related topics.